In a medium saucepan, combine the sugar, cornstarch and cocoa powder. In a measuring cup, combine the milk & egg yolk. Slowly whisk the milk mixture into the dry mixture and combine well until there are no lumps. Cook over medium heat, stirring constantly, until it comes to a gentle boil. If desired, add a 1-inch piece of dark chocolate. 46 Comments on "Chocolate Pudding"
I printed out the recipe, but the printable version has the title wrong as “Tapioca Pudding.” I’m going to try it tonight. 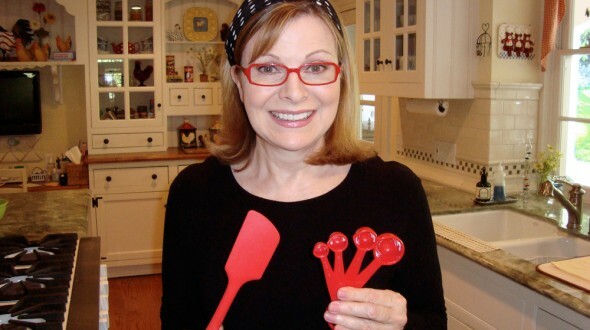 Thanks for your great recipes, Jenny. Thanks for letting me know. It is fixed. Made this chocolate pudding yesterday. 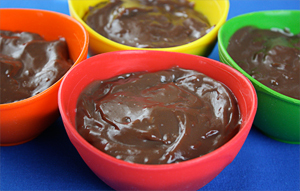 It is the BEST chocolate pudding I have EVER tasted!!!!!!!!!!!!!!! For those who are egg sensitive/averse, this pudding sets up just fine without it. I don’t use refined white sugar, used an organic cane (Turbinado) instead, and less of it than called for. Added some pieces of a dark Dove bar that melted in well. Layered the pudding with banana slices. Was very tasty warm, should be really good chilled. Questioning why the egg had to be separated, I made this with a whole egg, and it worked, with no apparent drawback. Perhaps it’s time to challenge the practice of separating the yolk when there’s no compelling need to do so? Great recipe Jenny. For those people who do not like a “skin” on their pudding just press a piece of plastic wrap onto the surface before chilling.Hope you are having a great day! I have a similar recipe called Chocolate Blancmange, and it was my favourite dessert as a child. It had coconut sprinkled on the top which really adds a nice taste and texture to the top layer. if you will highlight the recipe and then place your cursor into the middle of the recipe and right click your mouse it will pop up to print. That’s how I print out her recipes. Hope this helps. I’m going to make this choc. pudding and put it in your pie shell recipe that has been baked and cooled. Chill it and top it with homemade whipped cream. And some shavings of choc. 🙂 All is so good! Thank you Jenny. I am never enjoyed baking until I found you Jenny.. Have made your oven bake paczki donuts and cinnamon roll. They have been a big hit with all my family and friends. I am going to make the chocolate pudding and no knead bread today. Love you and your videos xxxx just amazing!!! Thanks for a very good chocolate pudding, only tasted the pudding left in the pan, and it was soooo good! Isn’t eating raw egg bad? If so what can I substitute for egg yolk?? Eating raw egg is not a good idea but the egg in this recipe is cooked. As the egg yolk cooks on the stove, it’s what helps thicken the pudding. Hi Jenny, I am new to your site and love it. I was wondering when you have 1% milk in your recipes if you can substitute skim milk instead. I never use skim milk so I can’t say for sure where it would work so you would have to try. Most times I count on the small amount of fat in 1% milk in my recipes so with this pudding, you would probably need more cornstarch. I’m sorry I missed your question but I was away for a couple of days. Did you double/triple and how did it go? Can I use a whole egg? I have never used whole eggs so I don’t know how my recipe would work if you change it, but I know there are other recipes that use whole eggs so you might be better to try one that’s proven using whole eggs. I would like to make almond pudding for my daughter. Can I substitute cornstarch with almond powdered? Thank you in advance! No, you need the cornstarch because that is what thickens the pudding. You could try using my recipe but adding almond extract instead of vanilla. Thank you Jenny. I just made your recipe and it came out beautifully, even though I messed-up and put the whole egg in. Did not realize until it was cooking. I kept cooking and stirring and it thickened right up. I added a quarter teaspoon of instant espresso powder to make it mocha flavored Next time, I will try adding some orange extract because I love chocolate and orange together. When I was in elementary school, back in the 60’s, the cafeteria ladies made warm pudding. Sometimes they put sliced bananas in the vanilla pudding and it was a special treat for me. Bananas were not in my family’s budget, so it was rare to have them. Just made this and it came out okay. I think I’ll add more chocolate next time. Sorry, I do not make ice cream. I made this on the weekend and it turned out perfect. I added some peppermint extract to mine as well as the vanilla in the recipe and YUM…chocolate mint pudding! Hi, I made the granola recipe and my family loved it! But now I want to try something a little different. I have always used the instant puddings and have been curious about making puddings from scratch, but I have always been concerned about the egg. This may sound silly, as I am a beginner cook, but I’m not sure if the egg is cooked all the way. Does it need to reach a certain temperature; is salmonella an issue? It’s not a silly question because uncooked eggs are not always safe to eat. But this pudding boils on the stove for about a minute (with the egg yolk) and that’s plenty of time to cook the egg yolk. In fact, it’s the cooking of the yolk that helps thicken the pudding. If it wasn’t cooked, the pudding would not thicken properly. Maybe watching my video would give you peace of mind when you see the bubbling mixture on the stove. Try the pudding. If you’ve been having packaged pudding, I think you will find that homemade is a lot better. I watched the video, but I’ll still try it. Thanks for the response. Do you have a recipe for vanilla pudding? Your chocolate pudding is the best I’ve had. This will be my only go to chocolate pudding recipe. I have to thank you for this pudding recipe it was so easy to make and omg so delicious,Thank you very much jenny. Hi Jenny, This pudding is amazingly delicious , I made a doubled batch of it tonight because everyone loved it, thank you for sharing this ammazig recipe . Hi Jenny! I’m nine and I live in the Philippines and I love your recipes! I did the Chocolate Pudding. It was fantastic! the chocolate pudding tastes amasing! I just made this this afternoon and instead of 1% milk I used Silk Almond Milk. I had some warm and some cold and it’s the best pudding I’ve ever had. So easy and so good. Family favorite! I LOOOOOOOOOOOOOOVE THIS! I’VE BEEN MAKING IT FOR A YEAR! It’s delicious! I made your chocolate pudding and my husband is definitely addicted to it!! I’m afraid I’ll have that problem with your granola recipe. I made it today and just love it. I also made the rasberry pudding from your cookbook and found it delicious too. I must tell you, I found your site by accident when I googled low fat chocolate pudding and yours came up. I just made it today and it’s absolutely delicious! I am so excited to try all of your other recipes, and look forward to the home made tortillas tonight. We moved to the Dominican Republic from Florida last year and we eat everything in tortillas. Thank you so much!